Berkman + Shapiro Orthodontics has a zero-tolerance anti-spam policy. We prohibit the use of our website or services in any manner associated with the transmission, distribution, or delivery of any frivolous or 3rd-party email. Berkman + Shapiro Orthodontics does not authorize the collection of email addresses or other information from our website or services. We forbid others from using our services to collect, compile, or obtain any information about our patients, including but not limited to our patient’s email addresses. We do not permit use of our services in a manner that could disable or overburden any aspect of another party’s use and enjoyment of our services. If Berkman + Shapiro Orthodontics believes that an improper or unauthorized use is being made of any service, we may take such action as we deem appropriate, including blocking messages from a particular internet domain, server, or IP address, and may immediately terminate any account that is connected with email that violates our policy. 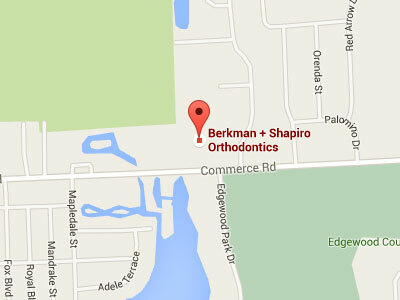 Unauthorized use of any Berkman + Shapiro Orthodontics services in connection with sending unsolicited email may result in criminal, civil, or administrative penalties against the sender and the sender’s associates, and Berkman + Shapiro Orthodontics may assist the relevant authorities in this regard. In the unlikely event that you receive any message from us that could possibly be considered to be spam, please contact us using the details below and it will be investigated. Berkman + Shapiro Orthodontics may change this anti-spam policy at any time.